This practical, how-to guide makes it easy for teachers to incorporate the latest technology in their classes. Employing an informal workshop approach, the book avoids technical jargon and pays special attention to the needs of teachers who are expanding the use of computers in their classrooms. The authors focus on what teachers do and how they can do it better, and provide a wide variety of proven tools, tips, and methods for enhancing these activities with technology. 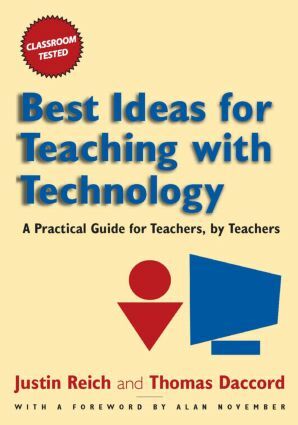 "Best Ideas for Teaching with Technology" provides extensively illustrated tutorials for a wide variety of software, online tools, and teaching techniques. It covers everything from lesson plans, to time management, how to show animation, blogging, podcasts, laptop strategies, and much, much more. In addition, periodic updates to the text will be available on the authors' website. Introduction; 1. Lectures: Enhancing Teaching and Learning with Multimedia; Introduction; Multimedia Presentations with Images, Video, and Audio; Searching for Images, Audio and Video: How to Find All That Good Stuff in the First Place; Using Video in the Classroom; BrowserPoint: Simple Web site Presentations with Tabbed Browsing; Projectors: Sharing Your Screen with the Classroom; Getting Data into Your Classroom; Final Thoughts; 2. Discussion and Communication; Introduction; Creative Uses of Email; Educational Uses of Blogging; Chatting; Bringing the World into Your Rroom: Skype and iChat; Final Thoughts; 3. Note-Taking and Organization; Introduction; Beyond the Trapper-Keeper: Keeping Students Organized Online; Taking Notes with Computers; Software Tools for Taking Notes; The Future of Note-taking: Tablet PCs in the Classroom; Class Scribe: Sharing Class Notes Created by One Student; Taking One for the Team: Collaborative Note-taking; Final Thoughts; 4. Guided Inquiry; Introduction; Online Scavenger Hunts; Virtual Tours; WebQuests; Google Earth; Select Web Sites for Guided Inquiry Activities; Final Thoughts; 5. Open Research; Introduction; Google: For Better or Worse, the Number One Student Research Tool; Search Directories; Library Catalogues; Grokker Visual Searching; Five Online Collections; Final Thoughts; 6. Homework; Introduction; Equity and Access; Assigning Online and Computer Homework; What to Do for Homework? ; Examples of Short-Term Online Assignments in the Humanities; Final Thoughts; 7. Writing; Introduction; Standard Formatting; Pre-Writing and Brainstorming; From Pre-Writing to Polishing: Best Practices for Writing with Word Processors; Beyond the Essay: Using Word Processors to Devise New Assessments; Writing Collaboratively with Wikis; Final Thoughts; 8. Student Presentations; Introduction; Student PowerPoint Presentations; Recording and Editing Audio for Podcasting; Screencasting; Building Simple Web Sites with Google Page Creator; Final Thoughts; 9. Assessment and Grading; Introduction; Online Tests and Quizzes; Giving Tests in an Online Environment; Designing Online Assessments with Templates; Sample Online Tests and Quizzes; Electronic Commenting and Grading; Online Rubrics: Finding Them, Designing Them and Grading with Them; Electronic Gradebooks; The New Frontiers of Online Plagiarism; Final Thoughts; 10. Class Management; Introduction; Teaching Strategies for the 1-1 Environment; Email: Getting on the Same Electronic Page; Course Management Systems; Setting Up Your Own Class Web Site; You and Your IT Department; Acceptable Use Policies; Online Safety and Health; Recommended Professional Development Resources; Visions of the Future; Parting Thoughts; About the Authors; Index.